YOP week of the 19th of April – Riviera Skies is done! My Riviera Skies top is finished! I quite like, and have been wearing it for the last few days. I think I may release a pattern for it, so if you’d like to be notified when it’s out or would like to test, please let me know here or via email. Separator image Posted in My kniting & crochet and tagged with crochet, crochet dress, Riviera Skies, YOP. Marishka Lace Scarf – Free Knitting Pattern. Beautiful, well done on completing it, it looks great on. That is so pretty! What a great job! Thanks so much for linking up to Snickerdoodle Sunday! That is colourful and pretty! Oh wow! That turned out just lovely and fits so well! I really love this top! Especially the yarn choice. Together, they make a great combo. I have chosen this as one of my EyeLoveKnots Yarn Favorites from the Yarn Fanatic Party #33, and featured in this week’s. Thank you for your kind words. The idea was in my head for about a year – as soon as I finally got my hands on the yarn, I started working on it. I am flattered that you have featured my top in your link party – I am sure to keep linking with you. Your top is very beautiful, you did a great job! Hello, this is lovely. I would be willing to test for you. Did you make charts too? Hello Karen. Thank you for letting me know, I’d be delighted to have you as a tester. The pattern isn’t ready yet, but it will have charts when done. 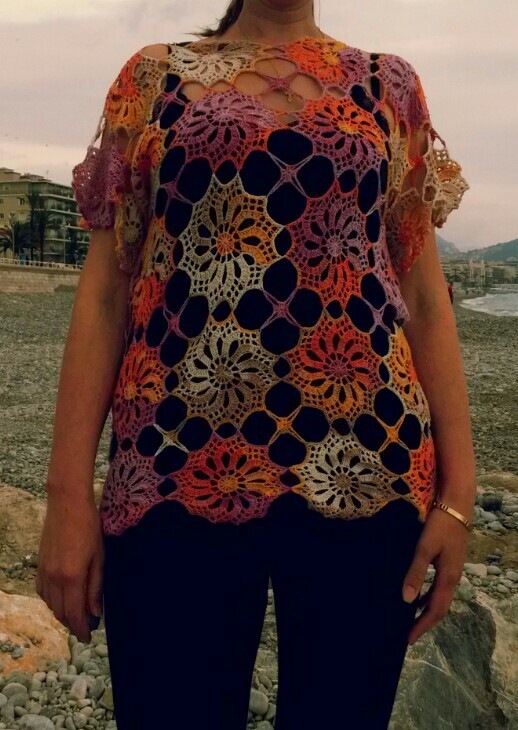 You can email me at silkandwool(dot) eu gmal (dot) com, and I’ll send you the pattern when it’s ready. Thank you. I’m in love with the yarn! Thank you. You can email me at silkandwool [dot] eu (at) Gmail [dot] com and I will send you the pattern when it’s ready. 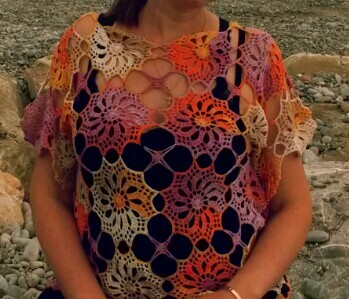 Beautiful I would love to have the pattern to this hope you can make it plus sized or tell me how to increase the stiches. Hi Karen! Thank you for your comment. I have put my email address in the previous comment. You can email me and I will send you the pattern when it’s ready. This is beautiful, I would very much like to try this pattern. Dear Marjorie, thank you for the comment. I the comments above you can find my email address – email me and I’ll send you the pattern when it’s ready. Very beautiful. I would very much like to try this pattern to. Oh, yes, I would love to have this pattern. It’s beautiful. I can see wearing your top. Thank you, Linda! 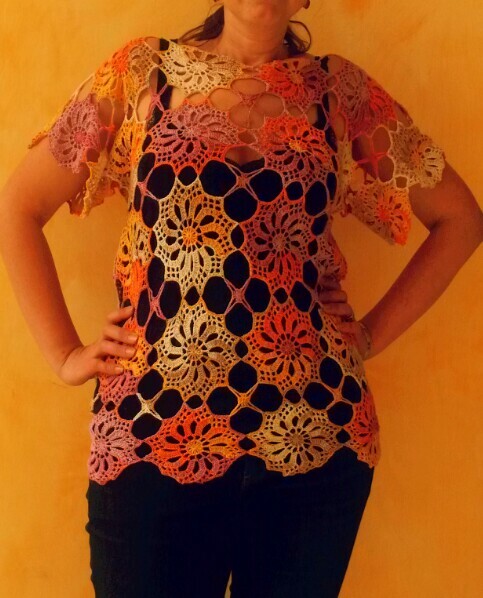 I will let you know when the pattern is available :) Can’t wait to start seeing the tests ! Dear Irma, thank you – I will let you know for sure! Again, beautiful. can’t wait ‘IL you release the pattern. Will be great for the summer months ahead. I forgot to tell you in my comment, I would be glad and pleased to be a tester for you.